Located in Lions Gate Drive in Winter Park, Winter Park Chateau is a boutique Victorian-style bed and breakfast ideally placed to explore the surrounding area. The Chateau offers well-appointed, comfortable accommodation in the form of nine guest rooms, which feature king, queen, and double beds, designer décor, private bathrooms and modern amenities, including flat-screen televisions and wireless Internet. Some of the rooms have fireplaces, jetted spa baths and private balconies with stunning views. The house also features a hot tub on the second-floor deck, a modern entertainment living room with a large, flat screen television for movie-watching and a lovely terraced back garden with a gazebo. Winter Park Chateau enjoys a prime downtown location within walking distance to many restaurants, cafés, and bars, as well as nightclubs. It is within walking distance of the ski mountain and close to four championship golf courses and the Rocky Mountain National Park. Winter Park Chateau features nine beautifully-appointed guest rooms with plush, country-style décor and comfortable furnishings. All guest rooms have king or queen-size pillow-top beds dressed in high-quality linens, down or hypoallergenic comforters, and pillows, and en-suite bathrooms with shower/bath combinations, single or double vanities, lighted make-up mirrors, plush towels and bathrobes, and organic bath products. Special touches include sinks in the rooms, ornate Victorian mirrors, classic armoires and armchairs, and wood-burning fireplaces, and modern amenities include flat-screen televisions with cable channels, alarm clock/radios, hairdryers, and complimentary wireless Internet. A complimentary European-style buffet breakfast is served each morning (for guests in the main lodge only) and includes freshly brewed coffee and tea, fruit juices, fresh seasonal fruit, egg dishes, and Italian meats and cheeses. Other delectable daily selections include newly baked sweet treats such as croissants, or blueberry muffins, homemade granola and Greek yogurt, and an assortment of fresh bread, jams, and preserves. Winter Park Chateau features an array of facilities that offer the creature comforts of home, including a modern entertainment living room with a large, flat screen television for movie-watching, a hot tub on the second-floor deck, and a lovely terraced back garden with a gazebo. Winter Park Chateau enjoys a prime downtown location within walking distance to many restaurants, cafés, and bars, as well as nightclubs. 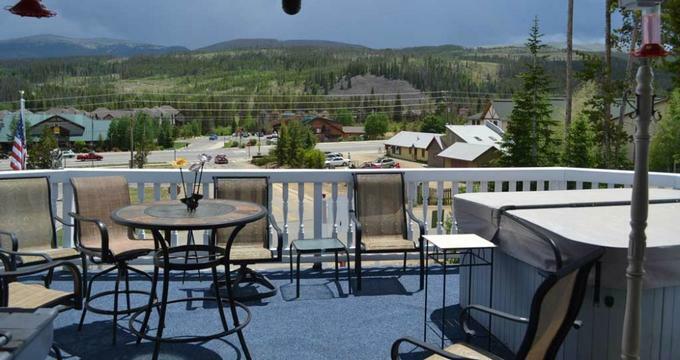 It is within walking distance of the ski mountain and close to four championship golf courses and the Rocky Mountain National Park. Winter Park Chateau offers an array of activities throughout the year, including skiing, snowboarding, snowmobiling, snowshoeing, cross-country skiing, and ice skating in the winter months. Summer months see activities such as camping, hiking, mountain biking, alpine sliding, boating, fishing, horseback riding, hay wagon riding, golf and hot air ballooning. Winter Park Chateau offers a beautiful setting for special celebrations such as weddings, receptions, ceremonies, and birthday parties of up to 75 guests, with venues such as an outdoor covered area, a pretty gazebo, the second-floor deck of the Chateau, and the first-floor reception area. Winter Park Chateau also provides a variety of exclusive wedding packages, guest services and professional event management, along with deluxe accommodations, upscale amenities and gracious hospitality.